I’m sure you’ve had to restore your iPhone at least once. Stuff happens, you try to reset some settings, but it still doesn’t work as it should. Since yesterday, I’ve been having trouble connecting to cellular networks on mine. If I put the SIM card in my iPhone SE, that works fine, so it seems to have something to do with iOS 12. I tried resetting network settings, and that worked for a few minutes, but then the same thing happened. So, it was time to restore the iPhone. I have a 15 Mbps internet connection, so the 3+ GB download for iOS only took about an hour. But then there’s all the apps to re-download. Because iTunes no longer manages apps, you have to redownload potentially tens of gigabytes of stuff. If you have music and photos in the cloud, you have to download some of them, but the apps alone make this process painful. In addition, you can’t pause the process; you can only put the phone into airplane mode. So if you do need to use the phone to make calls or use data, your connection is saturate, and you’re limited for the several hours it takes to get everything downloaded. When I think about all those who have even slower internet access than I do, I feel sorry for them. I feel sorry about Apple, who assumes that everyone has fiber, and can restore an iPhone in five minutes. It’s really quite a bit of contempt for many of Apple’s users. It makes life really complicated. Today Apple introduced the latest models of the iPhone and Apple Watch at the Steve Jobs Theater on the new Apple campus. If you’ve been following the Mac news sites, you’ve seen much of what was announced; leaks made this event less surprising that it often is. This is an “s” year, when Apple iterates the latest model iPhone without any major new features. There are two new top-of-the-line iPhones and one inexpensive model, similar in many respects to the flagship iPhones Xs. As for the Apple Watch, the update was more interesting. Some major new health-related features join new sizes for the device. 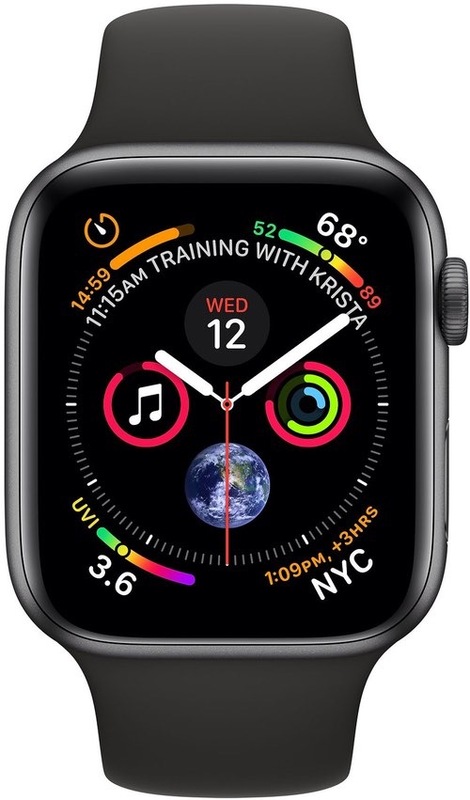 A redesign of some of the watch faces means that you will have access to more information at a glance. A new gold stainless steel model adds a bit of class to the product line. As I watched the event, I was particularly struck by the expression “Remarkable new dual camera system.” There’s nothing new about it, nothing more remarkable than last year’s camera system, which, while very good, isn’t really remarkable in the industry. The article dissects a number of claims that are really just fluff. Apple didn’t have much new to say about the camera, so they sort of made stuff up, or presented features that exist on other devices and tried to claim that they were Apple inventions. The iPhone camera is quite good for what it is, but Apple has depended on the camera to sell iPhones for years, and if they don’t have anything really new, then they have to fudge a bit. The thing with the background blur is interesting, though not unique to Apple, but all does is allow you to adjust the amount of blur that is applied to the depth layer of a photo by the software. I was actually more impressed by the ability to do that with the single-camera iPhone XR. Apple will announce their new iPhones later today, and it’s time that they improve the camera. Not the lenses or the software; that’s what they’ve done in recent years. Adding a dual-camera system is great, adding software features like portrait mode is interesting. But the iPhone camera is still only 12 megapixels, and many other smartphones have much better sensors. Apple increased the size of the sensor with the iPhone 5s, five years ago, and the iPhone X has a slightly larger sensor. They moved to a 12 Mp sensor with the iPhone 6s; that was three years ago. Bu other manufacturers have sensors that offer much greater resolution. The Nokia Lumia 1020 has a 41 Mp sensor, and phones from Motorola, Asus, Huawei and Sony have sensors around 20 Mp. Megapixels aren’t everything; optics are incredibly important, the ability of a sensor to work in low light is important (though part of that is related to the size of the sensor), and the software that makes the photos from the sensor is probably one of the most important elements. The dual lenses on certain iPhones allow you to have both a wide-angle and telephoto lens, which is great when you’re outdoors, but I find that indoors, the iPhone often switches to a zoomed shot of the wide-angle lens, with poor image quality, when I tell it to zoom. As we’ll see later today in Apple’s presentation of the new iPhone, the camera is incredibly important. In fact, it’s one of the few features they can tout that average users understand and appreciate. People take scads of photos with their phones, and having a better camera can get some people to upgrade. But while Apple’s software for converting sensor data to photos is excellent, they are lagging in the quality of the sensor. I hope that Apple ups the size to at least 16 Mp today; if they went higher, that would be a very good selling point to get people to spend more on an iPhone instead of buying one of the new cameras that have been announced in recent weeks. Update: not much new in the camera hardware, and some improvements in the software. We use our iOS devices to keep us up to date on important information. With notifications that can display on your iPhone lock screen, you can see who’s emailed you, important messages, and much more. But with the default iOS settings, sometimes private data that you don’t want others to see can display on your lock screen, and anyone who can see your iPhone or iPad can potentially access personal information on your iPhone, even if it’s locked. This means if your iPhone is lost or stolen, whoever has your iOS device will not need your passcode to look at the information that displays on the iOS lock screen. Even someone who randomly walks by your phone when you’re not there could potentially see sensitive information displayed on it while it’s locked. Fortunately, Apple’s iOS contains a number of privacy settings to control what data can display on your lock screen, but many people ignore these options. Want to keep your sensitive information private? In this guide, we’ll show you what you can control and how to change these settings to keep private data off your iPhone lock screen.